There has been quite a lot of online debate whether Singapore should implement a plastic bag charge. Environmental activist group, Zero Waste SG, called for our Singapore government and businesses to develop concrete plans to reduce the consumption of single-use plastic disposables in Singapore. The group proposed that retailers charge their customers 10 cents and 5 cents for large and smaller plastic bags respectively. Many objected to this plastic bag charge arguing that education alone is sufficient; this move will negatively impact the lower income residents in Singapore and that Singaporeans require plastic bags to store their waste. Excessive usage and wastage of plastic bags negatively impacts on our environment. It contributes to the wasting of nonrenewable oil resources and generation of carbon dioxide emissions from incineration, Littering of bags also harms animals and humans by becoming a breeding grounds for mosquitoes, and posing harm to the marine lives when the bags ends up in the sea. According to National Environment Agency, plastic bag usage is extremely high in Singapore. Singaporeans use a whopping 2.5 billion plastic bags each year. This is equivalent to 450 plastic bags per person each year! In my personal experience, I’ve also started to notice the problem of wasteful plastic consumption when I joined the workforce two years ago. During lunch time, many office workers would often ask for double bags even when it was not necessary; use plastic disposable cups even when they did not dabao and bring back disposable cutlery even when their pantry had cutlery for their use. 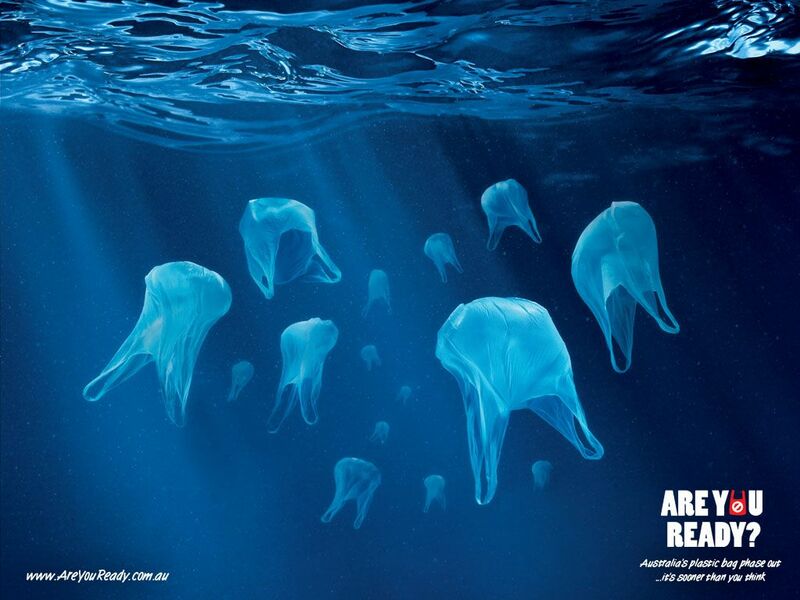 Plastic bags take up to 500 years to decompose. By not doing anything to resolve this issue and adding to the wasteful consumption of plastic disposables, the people down the road who suffers the consequences is our younger generation. To me, it is not right that we should not let our children and future generations pay for these environmental costs so that we can enjoy our “free” plastic bags. The move to charge for plastic bags has proven to be successful in many other countries. In Hong Kong, plastic bag consumption was reduced by a whooping 90%. In Britian, usage dropped by 85% 6 months after the policy was introduced. The overall usage was down by 6 billion. Many other markets have also implemented this policy including Taiwan, Penang, South Korea, Northern Ireland and several states in the USA. While some may argue that “If it works for other countries, it doesn’t mean that it will work for Singapore”, this may not necessarily be the case. Mandatory efforts by IKEA Singapore to charge 5 cents for plastic bags in 2007 (and to stop the sale of plastic bags completely since 2013) have resulted in much success. IKEA Singapore saw a reduction of 5.34 million plastic bags in the first year. Similarly, another Initiative by the National University of Singapore’s Students Against Violation of the Earth (NUS SAVE) club to implement a 10-cent plastic bag tax since 2010, have resulted in much success. while there has been an 86% reduction in plastic bag use on the NUS campus. Some concerned citizens expressed that this move to charge consumers for plastic bags may disproportionately affect the poor. This was my concern as well initially. However, upon listening to what Zero Waste SG explained, I realized that this does not have to be the case. To ensure the poor does not have to pay for plastic bags, NGOs and grassroots could distribute free reusable shopping bags to households in HDB 1- and 2-room flats so that they can use them for shopping. Zero Waste SG suggested that these reusable bags could be donated from the public (unused and washed) or from the private sector (excess bags from events). 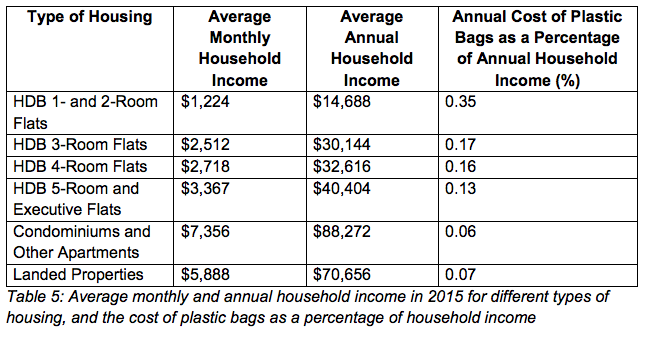 In fact, for many households, charging for plastic bags won’t be as expensive for them as you think. Zero Waste SG has calculated that if a typical household takes 520 bags a year from the supermarkets and reuse them for bagging waste, and if there is a 10 cents charge on each plastic bag, it would cost a household $52 a year. Bags used for carrying prescription medicines. Households would still be able to use those free plastic bags for bagging waste as well. In response to green activists’ calls, governments and businesses have replied that education and incentives are preferred methods to deal with this problem. NTUC FairPrice’s CEO Seah Kian Peng also expressed that while he would not rule out charging consumers for plastic bags, the company prefers to use an incentive scheme to reduce the use of plastic bags. The company introduced the Green Rewards scheme to reward customers who bring their own reusable bags with a 10-cent rebate for purchases above $10. This has resulted in 10 million bags saved in 2015, with a 10% decrease in usage of plastic bags year-on-year. However, it may not be financially sustainable for supermarkets and retailers. The rewards scheme costs FairPrice about $500,000 every year. If implemented island wide, this rebate might have to be subsidised by the government, or supported by companies and non-profit organisations with sufficient financial resources. In my personal view, public education alone has not really worked in fostering green practices among Singaporeans. In 2015, it was found that the amount of plastic waste generated in 2015 was 824,600 tonnes and only 7% was recycled. Plastic waste is also the most common type of waste disposed at the incineration plants in Singapore, followed by food waste and paper. According to Zero Wast SG, about 30-70% of plastics waste disposed in Singapore are single-use plastic disposables such as plastic takeaway containers and cups, plastic utensils, plastic bags, and plastic bottles. Singapore’s household recycling rate also pales in comparison to global standards. Between 2005 and 2015, it stagnated at 20% despite more than 15 years of the National Recycling Programme. This puts Singapore way below other developed economies like the United Kingdom and Taiwan, where the household recycling rates in 2013 were 44.2 per cent and 42 per cent, respectively. I hope that this blog entry has helped addressed some of your objections and concerns regarding the move to charge for plastic bags. If you’re interested to read more about this topic, Zero Waste SG has released a Position Paper on the reduction of single-use plastic disposables in Singapore and a recommendation paper on this topic. Please have a look at it as it is super informative and interesting. I do hope that after reading up more on this issue, more Singapore will be inspired to reduce waste consumption by bringing their own bags, not take plastic cutlery when dabaoing home or back to their office. I have started doing this and am going to start using my own water bottle to store drinks at shops which give me disposable cups. If you’re interested in environmental issues, do check out my other piece on Timely to get hawkers, schools to use less disposable plastic items. The views expressed here are my own and do not reflect those of any organization I am part of.